Working alongside garment workers, trade unions, consumers and campaigners, we are calling for those working in the garment industry to be paid a wage they can live on. The garment industry is a major employer across the world. In Asia, for example, over 15 million people work in this industry. With global brands making millions in profits every year, this booming industry has come to rely on, and exploit, the cheap labour of millions of garment workers whose wages fall far short of a living wage. The right to a living wage: A living wage should be earned in a standard working week (no more than 48 hours) and allow a garment worker to be able to buy food for herself and her family, pay the rent, pay for healthcare, clothing, transportation and education and have a small amount of savings for when something unexpected happens. The lack of a living wage means that many garment workers are forced to work long hours to earn overtime or bonuses, and they cannot risk refusing work due to unsafe working conditions or taking time off when they are ill. The low wages also mean that workers often have to rely on loans just to make ends meet and have no savings to use if they find themselves out of work or faced with unexpected expenses. We believe that all garment workers should be paid a wage they can live on, because having a job should mean being able to support yourself and your family. Calculating a living wage is a vital first step in making a living wage a reality. Clean Clothes Campaign is a member of the Asia Floor Wage Alliance who have calculated a living wage for the region where so many rely on the garment industry to be able to live a decent life. The Asia Floor Wage Alliance has made a clear visual explanation of how a living wage is calculated. The International Labour Organisation (ILO) has defined a living wage as a basic human right under their conventions and recommendations to the Universal Declaration of Human Rights Article 23 (ILO Conventions 95 and 131, ILO Recommendations 131 and 135). Clothing brands and companies: set concrete, measurable steps throughout their supply chain to ensure garment workers get paid a living wage! 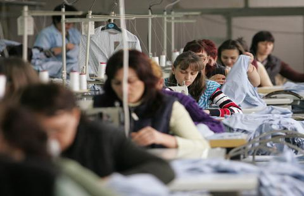 National governments in garment producing countries: make sure minimum wages are set at living wage standards! European governments: implement regulation to ensure companies are responsible for the impact they have on the lives of workers in their supply chain! We are calling upon H&M to stop turning its back on the commitment that 850,000 workers would be paid a living wage by 2018. Visit our campaign website to learn more and take action. Stitched Up - poverty wages in Eastern Europe and Turkey (also in Turkish). Tailored Wages - our latest report that looks in detail at the living wage policies of 50 global clothing brands. Shop til they drop - report looking at the impact of poverty wages in Cambodia. Stitching a decent wage - the history of the Asia Floor Wage. Read about garment workers' daily lives and their dreams. An alliance of trade unions and campaigners that calculated a living wage across Asia. Actions in support of the demand for a living wage across the world. Many workers in Europe are paid far below a living wage.